7 Sages(Qixian)Youth Hostel, Xi'an, Chiny : Rezerwuj teraz! 1.cheapest one day tour to the terra-cotta warrios. 2.free meet at the main train station. 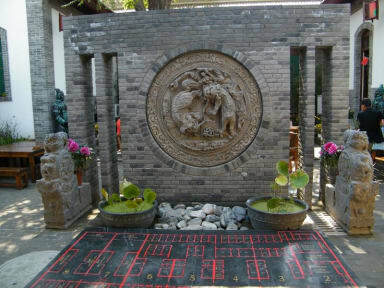 7 Sages (Qixian) Youth Hostel is located in a historical building near the grounds of the Shaanxi People's Government, just five minutes' walk from the metro station. 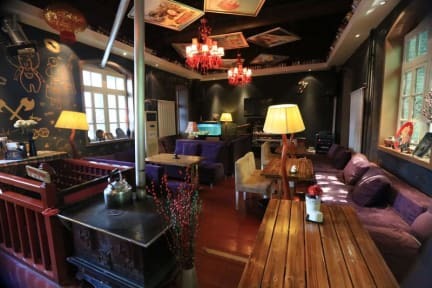 This stylish, comfortable hostel is 'an example of how a hostel should be. Reception and restaurant staff were both very helpful, competent and full of humour', according to one Hostelworld visitor. Many of our guests say they'd stay here again. hostel booking information in CHINA. Booking flight tickets for free. The hostel is in a classic Chinese row houses community - a real historical architecture in this ancient city. The property has been in existence for 100 years. The whole setting is romantic and its design is based on row titles and white wall, timber windows, straight path through circular arch, courtyard planted with trees and scrubs etc. The characteristics of this architecture tend to coincide closely with the history of Chinese culture. The original site contains 10 courts and the hostel is in count number2 to 8. In the modern history, it was also the command post for one of the renowned red army troops based in Xian. The new hostel is situated in, and being part of, the former 'Eight Route army Xian Office'. It went through being, in different period of time, underground revolution activities post, red army liaison office and a reception centre for people involved in the war fighting against Japanese during the first half of last century. A memorial museum is just next to the hostel within the same compound. I definitely thing our most unique feature is that we're located in a cultural relic building, a classic Chinese row house community, which gives a real insight into China's historical architecture. This place was previously a command post for Red Army troops. It's a haven of tranquillity amongst the hustle and bustle of the city. In fact, the Eight Routine Army Memorial Museum and the Guan Zhong Non-Material Cultural Heritage Museums are within 2-3 minutes' walking distance. I also recommend that guests visit the Terracotta Army Museum, reputed as the eighth wonder of the world and listed by UNESCO as a World Cultural Heritage Site. For fun around our hostel, we offer different games like table tennis, feather ball, snooker, chess, cards, daily movies, DVDs and books. We also organise different activities at some popular festivals.